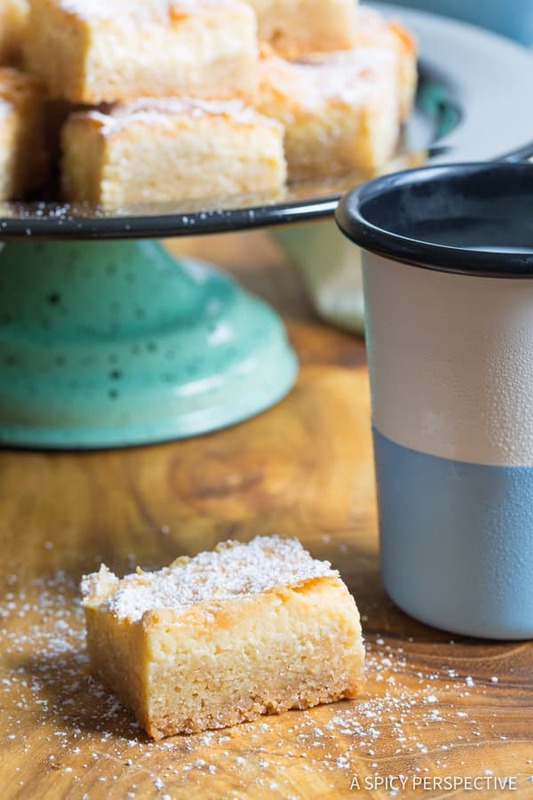 Say hello to The Best Gooey Butter Cake Recipe (From Scratch) we’ve ever tried! 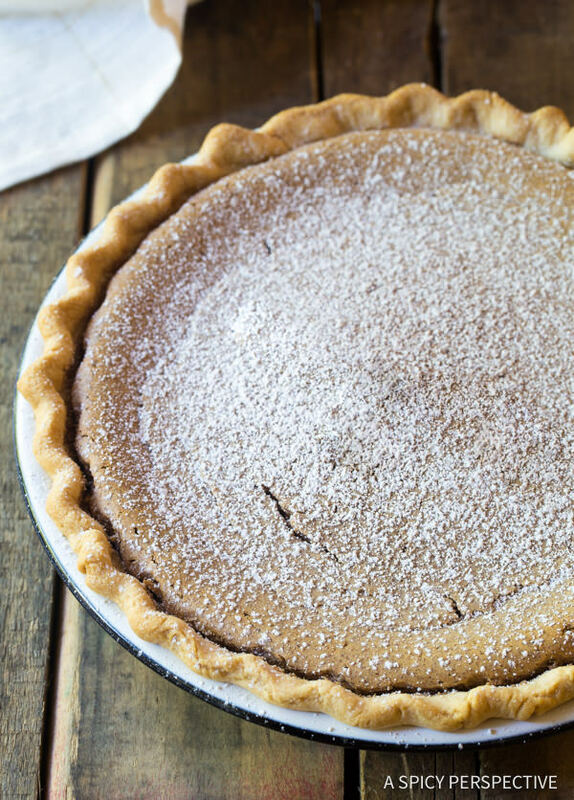 This is the solution to all your holiday dessert needs. 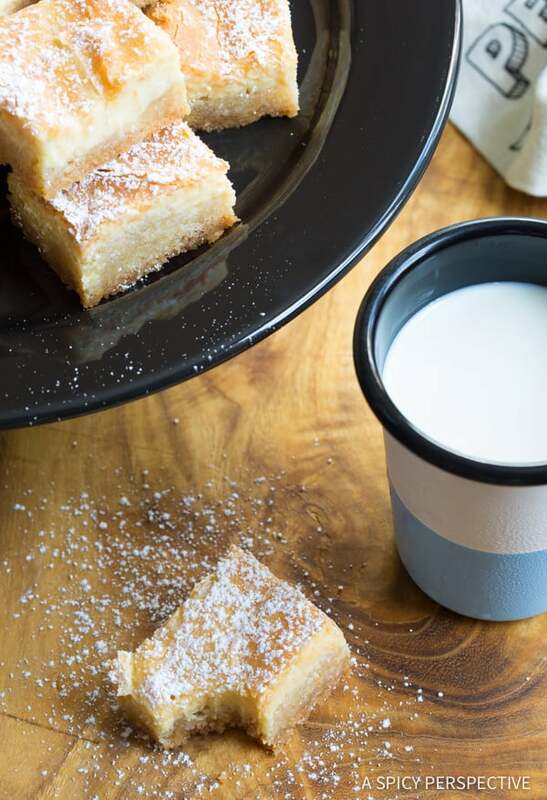 Sticky-sweet ooey gooey butter cake… Ever tried it? If not, you have been missing out! 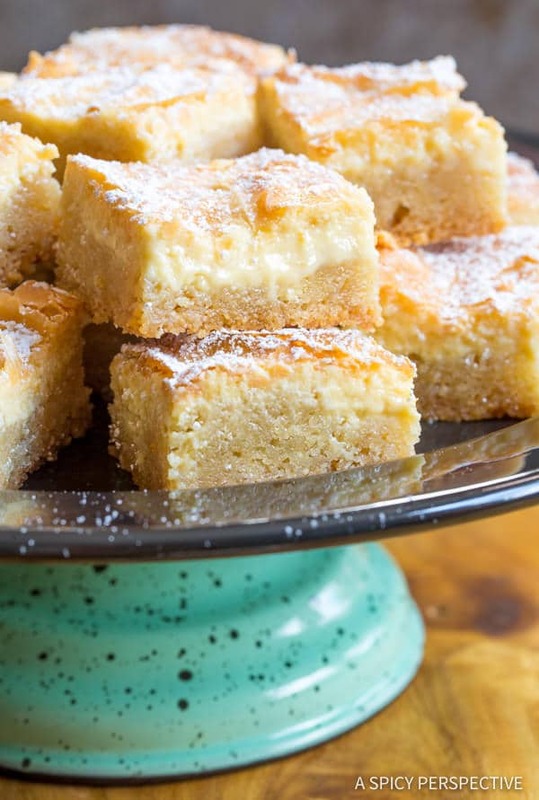 Gooey butter cake is a simple two-layered snack cake with a soft sumptuous top layer and a tender crumbly almost shortbread-like layer on the bottom. 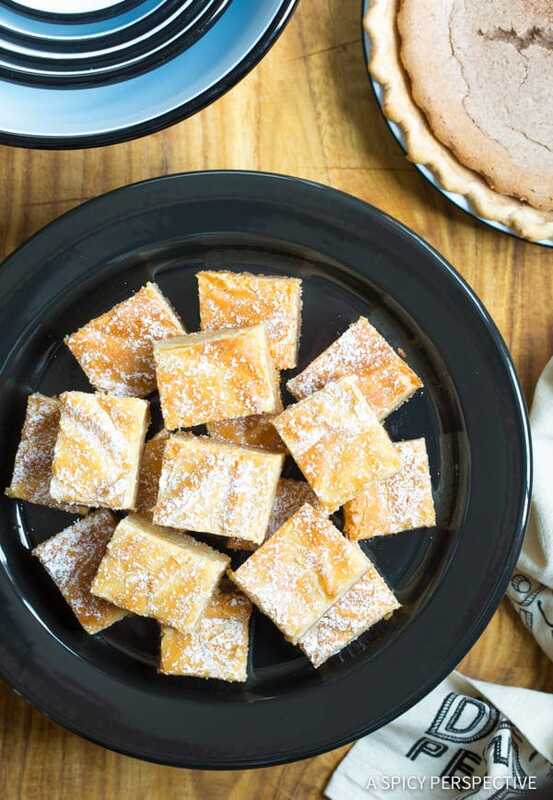 It originated in St. Louis, Missouri nearly a century ago, and is similar to other regional treats like southern Chess Squares and Philadelphia Style Cake. I like gooey butter cake the most, if only for its name. 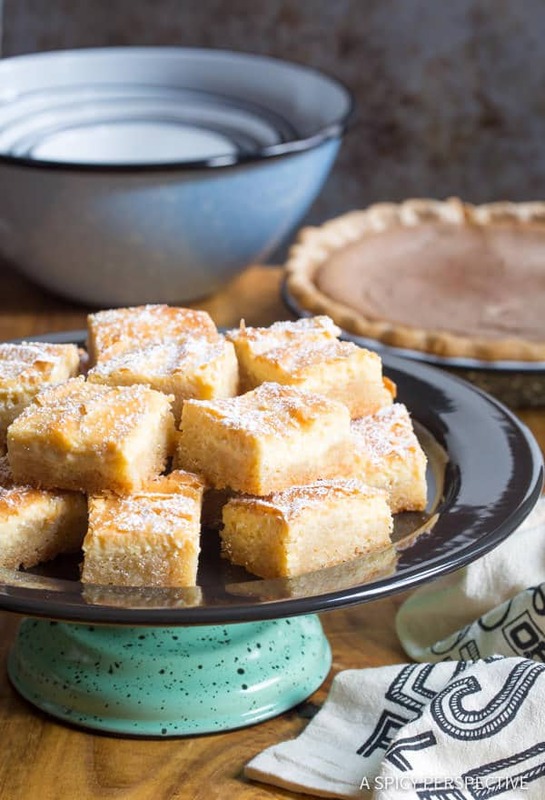 There are countless recipes on the web for semi-homemade and made-from-scratch Gooey Butter Cake, Chess Squares, and Philadelphia Style Cake. I’ve tried many of them. So many of them. In fact, when I decided to make my own Gooey Butter Cake Recipe, I tested the cake-mix version, the scratch-made yeast version, cream cheese and non cream cheese versions, and nut versions… All in the same week. You could say I get a little obsessive at times. Honestly, they were all pretty good. However the cake-mix version was definitely missing something, while the scratch-made yeast versions were just too darn lengthy to make. In the end, I took what I felt were the best elements of each recipe and created my own. So here it is, The Best Gooey Butter Cake Recipe (From Scratch) we’ve ever tried or made. I’m confident you will think so too. Our Best Gooey Butter Cake Recipe is the perfect dessert for holiday season. Decadent hand-held treats with massive homey appeal! 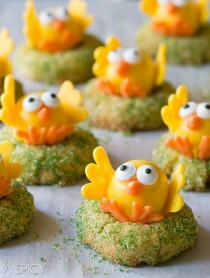 Serve at Halloween, Thanksgiving, and/or Christmas Dinner. Take them to parties. Wrap and mail as holiday gifts. Mix things up your holiday cookie exchange. The possibilities are endless. One thing is for sure, no one can resist the Best Gooey Butter Cake Recipe. By now you must have noticed the dazzling serving pieces displayed in the images. 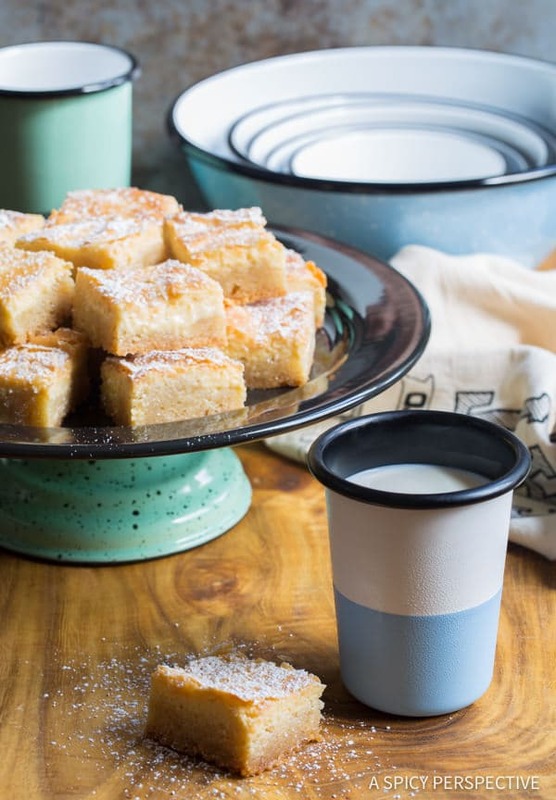 I am a huge fan of Barn Light Electric’s Porcelain Enameled Cooking and Serving Pieces. 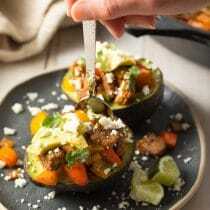 I’ve been using their stackable mixing bowls for the last couple years and recently discovered their new line of serving dishes and dinnerware. These beauties are must-haves for those who love to cook and entertain! If you are looking for a unique Christmas gift for your favorite cook, I can guarantee you he/she would be thrilled with these timeless dishes, bowls, cake stands, pie plates, and tumblers. Barn Light Electric is an American-owned family business, hand crafting works of art in Florida. Their dinnerware is designed and built just like their porcelain enameled lighting. Each piece is handspun from commercial grade steel, then painted with layers of porcelain enamel and baked at 1,500 degrees for a super sleek and sturdy finish. They are made to stand the test of time, whether in the oven, freezer, or dishwasher. Barn Light Electric Dinnerware is rustic, yet elegant, and is perfect for oven-to-table cooking and serving. Check out all Barn Light Electric’s New Products! Also find them on Instagram, Facebook, Pinterest and Twitter. Absolutely The BEST Gooey Butter Cake Recipe (From Scratch) we've ever tested! Similar to Chess Squares and Philadelphia Style Cake. Preheat the oven to 350 degrees F. Line a 9 X 13 inch baking dish with parchment paper and set aside. Place the almonds in a food processor and pulse until finely ground. Add the flour, sugar, baking powder, and salt to the food processor. Pulse to combine. Then add the eggs and butter. 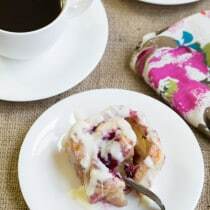 Turn the food processor on low and run until the mixture forms soft crumby dough. Dump the dough into the prepared pan. Lightly press the dough evenly over the surface of the pan. Don't pack it down too much. Set aside. For the top layer, wipe out the food processor bowl and add the cream cheese. Turn on high and whip to soften. Scrape the bowl with a spatula, then add the eggs, vanilla extract, and almond extract. Beat the mixture again until smooth. Add the powdered sugar and beat until smooth. Scrape the bowl again, and mix one more time to make sure there are no clumps. Pour the mixture over the bottom layer. Place on the middle rack in the oven and bake for 50-60 minutes. The top should be golden and puffed up in the center when it's done. If the top starts to turn dark before it puffs up, lay a loose piece of foil over the top to stop the browning, and continue baking. Allow the gooey butter cake to cool completely at room temperature. Dust with powdered sugar if desired. NOTE: For best cutting results, chill in the refrigerator for at least 3 hours before cutting. If you are in a rush, but want pretty pieces, place the pan in the freezer for 30-45 minutes. Then lift the entire cake out of the pan by the edges of the parchment and cut. Disclosure: This post is sponsored by Barn Light Electric. All porcelain-enameled loving opinions are my own. Is there a difference if i mix it in the mixer than in the food processor? Considering the almonds are already grounded of course. So rich and delicious! YUM! 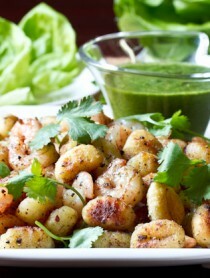 I am so excited to make this recipe! My mother used to make something similar growing up. Saving this one for sure! 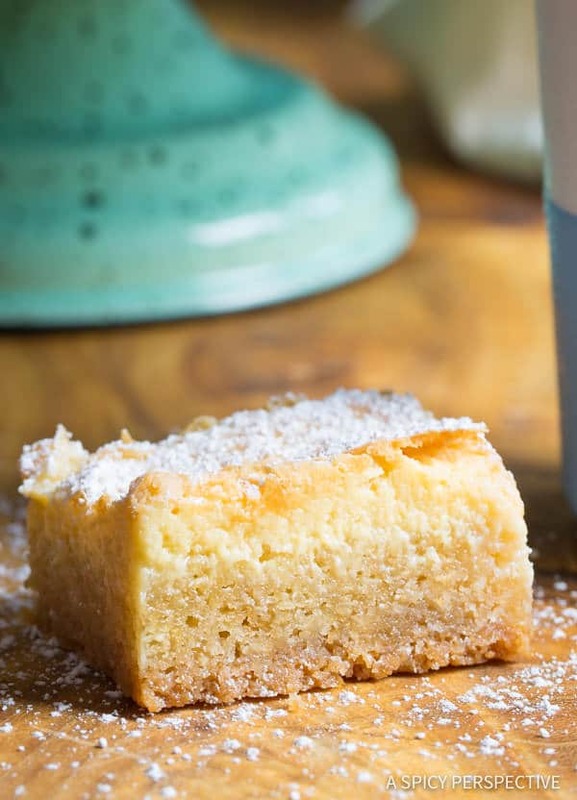 Being a St. Louis native, I always love comparing gooey butter cake recipes! This is great! I love making cookies from scratch! This was really amazing! I LOVE Butter Cake, but have never seen it done like this! So, I had to try it! IT DID NOT DISAPPOINT! Thank you! Can you make with Almond flour or Coconut Flour instead of All-Purpose Flour? I have not tried this one with almond or coconut flour so I can’t say for sure. However, I have made this with gluten free 1-to-1 baking mix and it turns out wonderful. I hope this helps! I’ve made this cake twice so far. Thank you so much for sharing the recipe, it tastes incredible! The only issue I’m having with it is the appearance. There are different sized bubbles and cracks on the surface. Any ideas how to make a smoother looking cake? 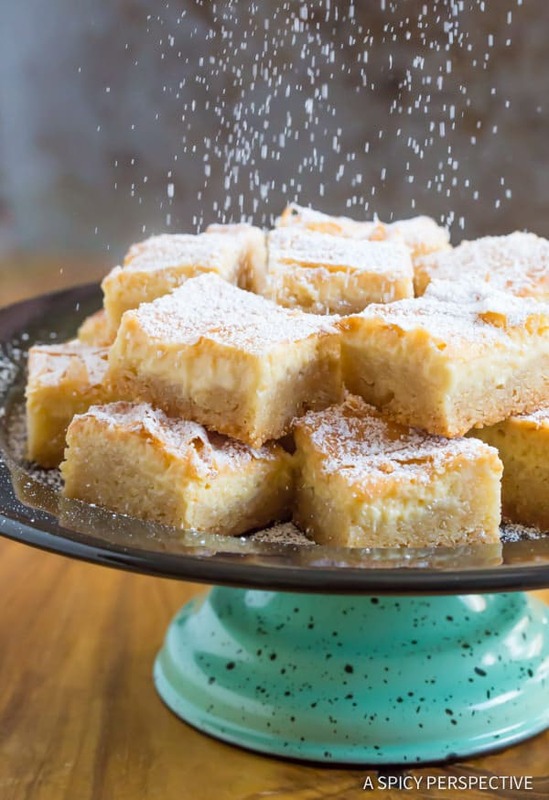 My friend’s birthday is coming soon, and she likes these Ooey Gooey Butter Cakes by Prairie City Bakery that are typically available in convenience stores. To surprise her I’d like to make one of these cakes from scratch, and your recipe is exactly what I was looking for! My question is, if I wanted to give the top layer a lemon flavor (her favorite), how much fresh squeezed lemon juice would I have to add? Also, if I wanted the top layer to have a peanut butter flavor (my favorite), how much peanut butter would I have to add in that case? Without testing the recipe with these ingredients, it’s hard to say. I might swap the almond extract for lemon extract, instead of juice, because it’s stronger. 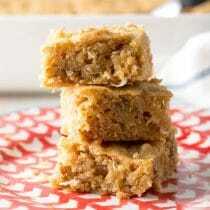 As for adding peanut butter, it will definitely change the texture of the top. I would start by swapping some of the cream cheese for creamy peanut butter. Maybe 1/3 to 1/2? Hope this helps! Made this amazing cake many times but still don’t know how to test for doneness. Anybody know? It’s always a guessing game because it’s so gooey. This is by far the best version of the gooey butter cake I’ve tried. 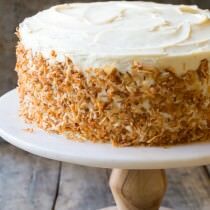 I think the almonds make a huge difference and NOT using a cake mix. Haven’t tried the yeast version but am curious. I didn’t have almonds, but it still turned out so delicious! Hi. I just saw your recipe. May I ask a substitution for the ground almonds for someone who has nut allergy. Thank you. These bars are definitely sweet, but we love them! 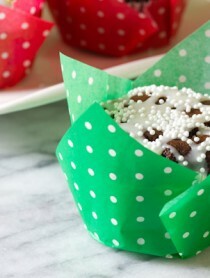 You could add a little less sugar if you like, but may need to bake them a few minutes longer. The pie in the picture above looks yummy! What kind is it, and is there a recipe link? OMG ~ can’t take how amazing this looks!! Oh WOW does this cake look decadent and amazing! And those serving pieces, too!! GORGEOUS! This gooey butter cake looks soo good! Why oh why haven’t I tired this before? Drooling over here. Sad this this is US only not for Canada too, because it’s gorgeous. But oh, that butter cake……PERFECTION! Um, yesssss. this looks awesome. This looks gooey and delicious! Ahhhh, butter cake is the best! So dangerous, lol! !